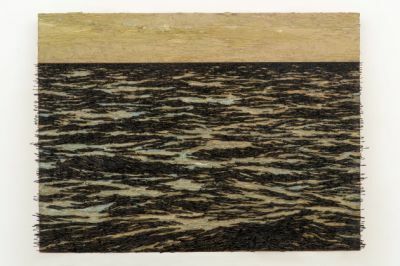 Ben Brown Fine Arts is proud to present Yoan Capote: Territorial Waters, Yoan Capote's first solo exhibition in Hong Kong and third solo exhibition with the gallery. The gallery space will be transformed by an installation of Capote's iconic 'fishhook paintings' from his renowned Isla series. These paintings present varying convergences of sea and sky, thousands of tiny fishhooks piercing the canvases to create rhythmic waters amidst thickly impastoed surfaces with bands of sky ranging from blood red to midnight blue. The exhibition will also include two suspended curved canvases that create a 360-degree immersive seascape. Capote's seascapes stem from his childhood memories of growing up on the politically isolated island of Cuba and his strong desire to see and experience the outside world. Capote notes, "The sea is an obsession for any island population . . . When I was a child, I looked to the horizon and would imagine the world beyond. The sea represents the seductiveness of these dreams, but at the same time danger and isolation." This duality is revealed in his Isla paintings - they are at once meditations on the sublime beauty and boundlessness of the wild seas, yet their construction of sharp, menacing fishhooks, many tainted with traces of blood, firmly connotes the dangers and impossibility of migration experienced by many Cubans. He continues, "I wanted to use thousands of fishhooks to create a surface that would be almost tangible to the viewer upon their approach; this would become the tactile experience of standing in front of a metal fence. The fishhook itself is an ancient tool that has kept its design for centuries and which is also symbolic of seduction and entrapment. For Cubans, the seascape imposes a political and ideological limit that has been dividing families, ideas and feelings for several generations; it is a mental wall between the present and the future that affects the collective conscience like a permanent fascination." The paintings vary in format and proportion of sea to sky-in some the stormy seas envelope the canvas into near abstraction while in others a vivid purple or red sky looms above the water-yet they are all hung along the gallery walls with a consistent horizon line to evoke the sensation of looking out windows, surrounded by water, the viewer becoming the island. Serially depicting a singular subject in various atmospheric conditions roots Capote in the artistic tradition of artists ranging from David Caspar Friedrich to the Impressionists to Hiroshi Sugimoto, yet his seascapes also serve as metaphorical devices to contemplate topical issues of migration, immigration, boundaries and borders.